I don’t have the opportunity to go to the movies very often, and I am choosy about which movies I see in the theater. Let’s face it, when movies cost $9.50 a pop, and I have two small children who can’t sit through most movies, I suppose it isn’t surprising that I might go only once a year. Do you remember being a teenager and going to the movies with your friends every weekend? I digress. My boss gave each faculty member gift cards to Starbucks and Regal Cinemas for Hanukkah — nothing extravagant, just enough for a cup of coffee and one movie ticket. However, I have always appreciated these gifts more than he might realize because I rarely get to indulge in going to the theater. I suppose for that reason, I also hang onto my movie gift card until something really looks good. Last year, I saw The Chronicles of Narnia with my gift card. This year, my gift card burned a hole in my pocket for some time. There really wasn’t anything out that I wanted to see. I saw a few commercials for Freedom Writers and decided it looked good, so I decided to use my gift card on this film rather than wait to use it on Harry Potter and the Order of the Phoenix as I expected I might have to do. I was not disappointed, and I believe I would have paid to see the film. The film begins as Erin Gruwell, a fresh-faced, naive first-year English teacher is given her classroom assignment of remedial freshman classes. She carefully chooses her outfit for the first day, confidently adding a string of pearls her department head advised her not to wear to school. When she peeks in her classroom for the first time, I couldn’t help but be reminded of my own first look at my classroom in my first year teaching. She writes her name in neat cursive script, and as she waits for her class to file in, her excitement is palpable. The very first day, a fight breaks out in her class and it is clear that this experience is not going to be what she thought it would be. A short exposition reveals the violence and despair that are a daily part of her students’ lives. She resolves to keep fighting, despite the advice of her father and worries of her husband. When she finds a racist cartoon drawn by one of the students, she uses the moment to teach the students about the Holocaust. The classroom is gradually transformed into family, a safe zone, and a vibrant writing lab. Students begin to chronicle their lives in diaries given to them by Ms. Gruwell. Students read literature like The Diary of Anne Frank and begin to see how others have dealt with living in war zones that resemble their own home in Long Beach. They write letters to Miep Gies, who sheltered the Frank family in her home during the Holocaust, and raise funds enable Gies to come and speak at their school. The reviews on this film are mixed, mainly because Freedom Writers is not the first film to feature a white teacher transforming the lives of students — in this case, Cambodian, African-American, and Hispanic (along with one very scared white kid). I can’t deny that it’s true that this story has been done before; however, don’t let that discourage you from seeing it. I thought the movie was incredibly moving. I think if you have ever taught a difficult group of students — or perhaps if you’ve ever taught, period — and this movie fails to make you cry at some point, then you have a heart of stone. I think all of us walk into a classroom at some point, believing we will be crusaders who change the world. We have these little mugs that say “2 teach is 2 touch lives 4 ever,” right? Or the little poster that says, “A teacher affects eternity; he can never tell where his influence stops.” I think many of us begin the profession with the same eager optimism that Hilary Swank as Erin Gruwell captures so well in the film. Many of us gradually become more like Gruwell’s department head — convinced the kids are bad, unteachable, and ultimately going to quit school anyway, so why bother? Or we become like the teacher in Erin’s department who refuses to teach anyone but Honors students or upperclassmen. I read at least one review that took exception to the portrayals of Erin’s colleagues, but anyone who has ever taught has run into teachers just like them. However, one simply doesn’t run into teachers like Erin Gruwell often. I wonder what she's doing now. I'll have to go google it. That's one of the things that makes me so hardhearted about seeing movies like this. These teachers burn out so quickly and then move on to do other things and ultimately, not teaching. When the "less amazing" teachers stick it out for 30 years, trying to make changes as we go…giving to our students the very best parts of our entire youth/young adulthood/middle age. I love teaching and couldn't imagine doing anything else. I love my students, but I don't think I can change the world…only students. 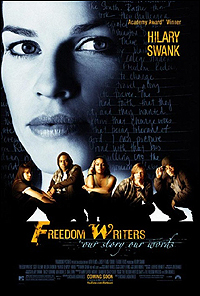 Thank you for your comments about "Freedom Writers." I have no illusions about saving the world, but I do want to see the movie, now that I have a first-hand report. I read the book this summer, and I was turned off by the Dangerous Minds factor AND by the impossibility of achieving what she did factor. Probably jealousy. I do not have the stickt-to-it-iveness to do that, and I'm pretty sure that her 4th year was her last year there. Teachers of the Year and/or teachers-who-get-movies-made-about-them distort what is expected of teachers–and those teachers get to go on motivational speaking circuits and don't have to grade stacks of papers after having spent maybe 5-10 years in the classroom. This film has not opened in the UK yet, Dana, but your recommendation – plus my interest in the teaching process and my admiration for Hilary Swank – will definitely make me go and see it when it arrives here. She (the real teaher) taught five years there. I too was sorrta put off by the fact (that as the credits scrolled) they said she had followed some of her students to a community college to teach. (after the five years) Wahhhhhhh. If she was that good, she shulda stayed the course. I agree with all yr comments on that. I saw the movie last night, along w/ my better half, a journalist who (seriously) HATES movies. But he wuvved it. Previously, we had (only) seen "Walk the Line" and before that, the re-release of "Gone With the Wind." I did Google the real reacher today and enjoyed watching four or five U-Tube vids of her. I promise you that she is egggszacccctly like the actress, in mannerisms and even (close) in physical beauty. Is the book worth the buy? I think I would be more interested in her (teacher) diary entries as opposed to the kids'. I am anxious to here about yr field trip. I think it is interesting that we saw that movie, "Freedom Writers," on this MLK holiday weekend. I know you are exhausted from yr trip w/ the runts but bet you had a super time. Welcome back.